In the spirit of National Donut Day I decided to share carbohydrate information on different kinds of donuts! We all know that donuts come in different shapes, sizes, and flavors, which makes carb counting even harder! 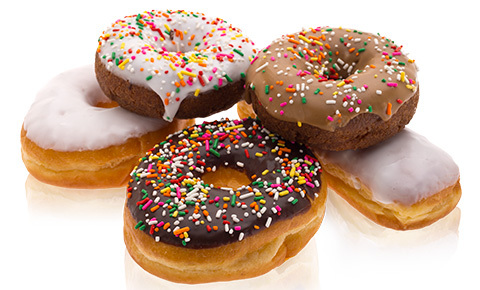 Each donut store, such as Krispy Kreme and Dunkin’ Donut may offer the same kind of donuts, with different amounts of carbs. For example, the Glazed Donut at Krispy Kreme is only 22 grams of carbohydrate, where at Dunkin’ Donuts the Glazed Donut is 31 grams of carbohydrate. Even though we have type 1 diabetes does not mean that we can not have a good donut, when we want one! So eat a donut today and don’t forget to dose! Thanks for reading and I hope you enjoy your donut today! Happy National Donut Day to you all! Information provided in this article was collected from these websites, Click below to find more donut carbohydrate information.